Dosage Form Design Parameters, Volume II, examines the history and current state of the field within the pharmaceutical sciences, presenting key developments. Content includes drug development issues, the scale up of formulations, regulatory issues, intellectual property, solid state properties and polymorphism. 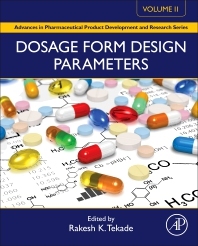 Written by experts in the field, this volume in the Advances in Pharmaceutical Product Development and Research series deepens our understanding of dosage form design parameters. Chapters delve into a particular aspect of this fundamental field, covering principles, methodologies and the technologies employed by pharmaceutical scientists. In addition, the book contains a comprehensive examination suitable for researchers and advanced students working in pharmaceuticals, cosmetics, biotechnology and related industries. Dr Rakesh K Tekade, Assistant Professor of the Department of Pharmaceutics, investigates the design, development and characterization of targeted nanotechnology based formulations for the site specific delivery of therapeutic drugs, siRNA, microRNA, plasmids, proteins and peptide for the treatment of cancer. His current research encompasses development of novel polymeric nanomaterial for effective cytosolic delivery of anticancer bioactives. Dr Tekade’s research is focused on designing a new generation of nanoparticles, which could identify the cancer cells and selectively deliver anticancer drugs and genes to inhibit the growth of cancer while sparing healthy tissues. His research work involves the applications of polymer chemistry, nanotechnology, molecular biology, pharmacokinetics/pharmacodynamics and imaging techniques. Dr Tekade has also investigated the anticancer activity and molecular mechanism of several compounds and nanoformulations against cancer cell lines. Dr Tekade has over 70 publications, 01 patent, 7 book chapters, and 3 editorial articles. He has delivered several invited research talks and presented research finding in more than 30 scientific conferences.